Instant downloads of all 945 LitChart PDFs (including The Brief Wondrous Life of Oscar Wao). Welcome to the LitCharts study guide on Junot Díaz's The Brief Wondrous Life of Oscar Wao. Created by the original team behind SparkNotes, LitCharts are the world's best literature guides. A concise biography of Junot Díaz plus historical and literary context for The Brief Wondrous Life of Oscar Wao. A quick-reference summary: The Brief Wondrous Life of Oscar Wao on a single page. In-depth summary and analysis of every Chapter of The Brief Wondrous Life of Oscar Wao. Visual theme-tracking, too. Explanations, analysis, and visualizations of The Brief Wondrous Life of Oscar Wao's themes. The Brief Wondrous Life of Oscar Wao's important quotes, sortable by theme, character, or Chapter. Description, analysis, and timelines for The Brief Wondrous Life of Oscar Wao's characters. Explanations of The Brief Wondrous Life of Oscar Wao's symbols, and tracking of where they appear. An interactive data visualization of The Brief Wondrous Life of Oscar Wao's plot and themes. Díaz was born in the Dominican Republic but grew up in a working class family in Parlin, New Jersey. He then attended Rutgers College and began to start his career as a writer. He has written three best-selling novels: Drown and This Is How You Lose Her. He is an active member of the Dominican Workers’ Party and often speaks about issues of racial relations in the Dominican Republic and in America, as well as immigration policy. Since the publication of Oscar Wao, Díaz has won numerous awards, including the Pulitzer Prize for fiction and the MacArthur grant in 2010. As of 2016, he is the fiction editor at Boston Review and the Rudge and Nancy Allen Professor of Writing at the Massachusetts Institute of Technology. 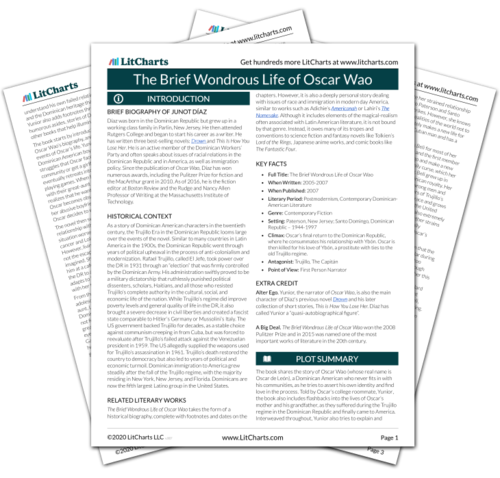 Get the entire Oscar Wao LitChart as a printable PDF. As a story of Dominican American characters in the twentieth century, the Trujillo Era in the Dominican Republic looms large over the events of the novel. Similar to many countries in Latin America in the 1900s, the Dominican Republic went through years of political upheaval in the process of anti-colonialism and modernization. Rafael Trujillo, called El Jefe, took power over the DR in 1931 through an “election” that was firmly controlled by the Dominican Army. His administration swiftly proved to be a military dictatorship that ruthlessly punished political dissenters, scholars, Haitians, and all those who resisted Trujillo’s complete authority in the cultural, social, and economic life of the nation. While Trujillo’s regime did improve poverty levels and general quality of life in the DR, it also brought a severe decrease in civil liberties and created a fascist state comparable to Hitler’s Germany or Mussolini’s Italy. The US government backed Trujillo for decades, as a stable choice against communism creeping in from Cuba, but was forced to reevaluate after Trujillo’s failed attack against the Venezuelan president in 1959. The US allegedly supplied the weapons used for Trujillo’s assassination in 1961. Trujillo’s death restored the country to democracy but also led to years of political and economic turmoil. Dominican immigration to America grew steadily after the fall of the Trujillo regime, with the majority residing in New York, New Jersey, and Florida. Dominicans are now the fifth largest Latino group in the United States. The Brief Wondrous Life of Oscar Wao takes the form of a historical biography, complete with footnotes and dates on the chapters. However, it is also a deeply personal story dealing with issues of race and immigration in modern day America, similar to works such as Adichie’s Americanah or Lahiri’s The Namesake. Although it includes elements of the magical-realism often associated with Latin American literature, it is not bound by that genre. Instead, it owes many of its tropes and conventions to science fiction and fantasy novels like Tolkien’s Lord of the Rings, Japanese anime works, and comic books like The Fantastic Four. Climax: Oscar’s final return to the Dominican Republic, where he consummates his relationship with Ybón. Oscar is then killed for his love of Ybón, a prostitute with ties to the old Trujillo regime. Alter Ego. Yunior, the narrator of Oscar Wao, is also the main character of Diaz’s previous novel Drown and his later collection of short stories, This is How You Lose Her. Díaz has called Yunior a “quasi-autobiographical figure”. A Big Deal. The Brief Wondrous Life of Oscar Wao won the 2008 Pulitzer Prize and in 2015 was named one of the most important works of literature in the 20th century. Mueller, Bethany. "The Brief Wondrous Life of Oscar Wao." LitCharts. LitCharts LLC, 14 Dec 2016. Web. 23 Apr 2019. Mueller, Bethany. "The Brief Wondrous Life of Oscar Wao." LitCharts LLC, December 14, 2016. Retrieved April 23, 2019. https://www.litcharts.com/lit/the-brief-wondrous-life-of-oscar-wao.